"Super thanks for team Fnp... always provide quality products..."
Perfumes delivery to Delhi to surprise the receiver! Are you willing to send perfumes to Delhi online? We are your one stop destination to sending imported and branded perfumes to make your entire shopping experience a pleasurable one. Whether you wish to avail the sublime notes like citrus or the oriental notes such as the smoky amber in perfume, you can get everything at our store. Perfume lovers adore the fact that we have stocked leading brands like Calvin Klein, Davidoff, Azzaro and Antonio Banderas much to the delight of our cherished customers. Our product section caters to different choices and budgets. If you want to buy the men’s perfumes to be gifted on Bhai Dooj, Birthday, Valentine’s Day, you can buy them and get the same day delivery service. 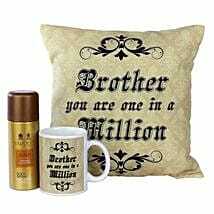 Send personalized gifts online like coffee mugs, photo frames, pendants, personalized jewellery, etc. Why us to send perfumes to Delhi? If you are intending to take perfumes delivery to Delhi, we are there to assist you. Check out our website immediately to gain access to the range of perfumes. The perfumes available with us cater to the customer-friendly initiatives only like the TrustPay and 10 days of return guarantee if you are not satisfied with the product. Send perfumes to Delhi on Birthday, Anniversary, Valentine’s Day, Father’s Day, and Mother’s Day and get free shipping on minimum purchase. Along with the perfumes, send gifts to Delhi like Chocolate hamper, flowers, and gift boxes from us to surprise the receiver. 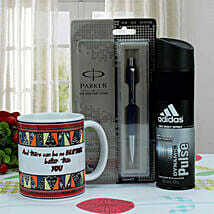 We cater other locations and send gifts to abroad as well like China, Japan, Australia, UK, USA and UAE. From us, you also get free gift wrap services and beautiful greeting cards where you can add your personal messages.